A graduate is person who have recently been graduated from a college or university. They are the fresh entry in the world of work. The graduates are either hired by the companies during their requirement period during campus selection or they search for a job on their own. In many interviews, we can find new and fresh graduates looking for a job. It may be a good or bad idea for taking them in the job as per your view. Here are some of the reasons so as why to hire them as a possibility. Fresh graduates have their own set of advantages due to which companies prefer campus placements to hire freshers directly after their studies completion. 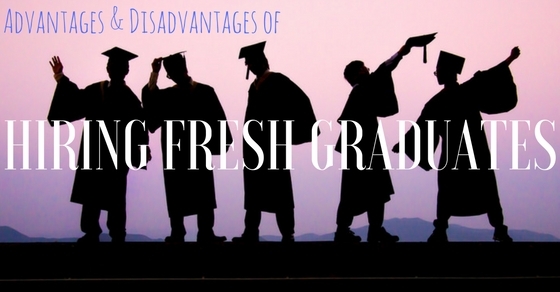 These advantages of hiring fresh graduates can benefit many companies. There are several factors which can contribute to the hiring of fresh graduates. Some of them are mentioned below. As they are new in the industry and based on their experience level they are less expensive than the professional experienced ones. Providing fewer salaries doesn’t mean that you will lower their salary too much. Give them money according to their talents and abilities. It is more likely to help. Moreover fresh graduates rarely complain of greater salary than experienced ones. So if you are just a startup company or experienced one, hire the fresh one for cost effective factor. The new interns haven’t been to the old and repeated industry before. They are the new and fresh graduates who have done few internships but never have been too deep in the new world. So here is the chance where they are trained to give you brilliant new ideas. Their view perspective will be from a different angle, different from those ideas and views you had before. This will be surely beneficial to you. They can also point out your previous mistakes which were not paid attention in the past. New ways and new things can be implemented in your organization. Graduates are new to their work which is the initial point or starting off their career. So that’s is why they tend to get very serious with their job and pay more attention to their work. The old employees or experienced one take it easy because of their past experience. That may result in a slow work and lazy result. But the fresh ones are always serious and are willing to do overtime and take more projects to grab the attention of the people around them and to let them know of their talent and skills. This is the reason the work done will be ampler. The new generation or the new people are very skilled in handling new software or technologies. That is why these people are more efficient than the old employees who are just following the old methods. The new graduates are more interested in getting information about new updates and making the work easier. They are very stealthy in the desktop and mobile chores and can add a new effect or twist to the work given to them. They are always willing to do good and new things which are beneficial to your own organization. As the graduates are new to the place they are ready to learn and adapt accordingly. They are very enthusiastic about learning and knowing new things. They won’t complain much and will work harder to prove how eligible they are for this job. These qualities of the graduate will help the company to grow in a new and better way. Utilizing these things will be beneficial for you. As the fresh graduates are just out from their respective colleges their minds are filled with good administrative and diplomatic skill. They are good in handling new software and have great computer skills. So having them as an employee will help to get more updates and news about the things which can make your work more good and perfect. The old employees have a stereotype nature and believe that their working is the finest way and should be always considered to be the best additionally, they won’t accept any changes. But the newcomers have the capacity or ability to change. So it is quite easy to make them do anything. From a small assignment project to bigger one, they are the determined bunch of people who are enthusiastic and energetic to learn. So hiring them would be profitable. Nothing can beat a learner at any stage. If a person wants to learn and do things differently than others, then success comes easily for the company. Fresh graduates are still undergoing the learning stage. So there are practically a lot of things that can be taught to them and in return get amazing results for the company. If fresh graduates are handled properly, they will work practically more than the experienced ones. And they are the most eager people to learn about anything and everything. As there is a flip side to everything, hiring fresh graduates have its own set of disadvantages too. Fresh graduates are more like inexperienced people who can sometimes blow up the entire operation if not made them understood properly. So proper handling is very much required for the fresh graduates than the experienced one, who require little or no nurture to work. Some of the reasons of failure are discussed below. As they are new and young they prefer to keep experimenting with their job and work. If they think they will perform better or do better in a different job or area or company their interest may shift to that. If they get any good payment in a different organization, they won’t think twice before shifting to that place. They would like to have a better job and would like to experiment with their jobs. They are not fixed or stable during their job which is not adaptable with the surroundings. As the fresh graduates are new in the industry, they won’t have a proper knowledge of diplomacy needed for any field. Even if they are trained at that in their university they won’t be able to do it properly as having the knowledge and applying it is a different thing. They may have many problems at the starting. If the employee is of rebellious nature then it will be more of a problem. As a junior, they should be humble to others. Some understand that quite easily and some don’t. This results in cold mutiny within the industry. They have very high expectations regarding their job and salary. They expect the employer to give them money as they expect. They sure do work hard but they can’t be paid like an expert or professional in that field as they are just joining the organization. If the employee works hard and is able to prove his talent then he can negotiate with the boss for a raise. Without that, it’s not appropriate or correct to ask for anything without any prior reasons. If one is good and smart enough then he is sure to get raise for that. As they are fresh people in the new field they are not that professional yet. They need to be trained and taken care of. They need to tell at first, what to do and not to do. They are new so ofcourse, they are unknown about the environment or the rules of the office. They must dress properly according to the rules and must not disobey their seniors. They are needed to be told a lot and lots of changes in them are yet to be made in them. So it takes a lot of time and labor to train them to be fully professional and no industry wants that. The fresh graduates may have the compatibility issues at first. As they are in a new environment they need to adjust and know new people. If the person is friendly then it won’t be much of a problem. But if the person is an introvert one then they will feel uncomfortable around other people and may complain a lot. This will create a lot of problems between the employer and the employee. If they can’t adjust to the office then they would prefer to leave the job as they are not that consisted like the old ones. Sometimes this can create communication barrier which can lead to bad impression. Sometimes fresh graduates tend to behave recklessly in the workplace. It is needed to understand that workplace is such a place where professionalism is worshiped. They need to respect it and abide by it no matter whatever the situation might be .Fresh graduates needs to be humble all the time. Their rashness can cost them their job. All they need to remember is that there are thousands of fresher job seekers available for the post, and they need to maintain their job in the office. So maintaining proper behavior in the workplace is very necessary. The fresh graduates are very enthusiastic about their work and are willing to do more work to prove themselves before their senior as it is the only way through which they can get a raise or a better position than before. Their new ideas and ways are sure to take your organization to a good level. The same old method or tradition won’t last much. Soon its charm will be gone then only the new conception or notion of the fresh minds will come in play. Giving up on new minds just for few reasons isn’t a good idea. So make sure to have a good look at the employee you are going to take in and then you won’t regret your decision for sure. Everybody gets perfect after less practice. If you are willing to give them a chance then they won’t disappoint you much. You just have to believe. There will always be choices available whether you want to hire fresh graduates as your workers or experienced ones. People usually prefer experienced ones over fresh graduates. But you never know who is more talented in terms of experience. So hiring any of them is a give-take chance. Choosing carefully is very crucial in this condition. Fresh graduates needs to be handled properly in a workplace. There will be a good and bad side to everything but you have to take everything and work accordingly. The complaints done by the fresh graduates isn’t that wrong either. They are in a new place with a new bunch of people, it’s very normal that they will get many issues on that. They were just seniors at colleges and then they suddenly the juniors of many other people in one go, so it’s predictable how difficult it will be for them to adjust. So choosing carefully whether to accept fresh graduates or at what time is it necessary to accept fresh graduates is very crucial.